Rural Lifestyle? 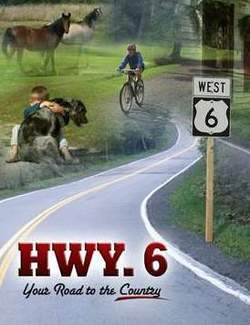 We talk about it each week on Highway 6 - Your Road to the Country this nations only full hour live radio talk show that focuses on small farms and acreages. We're heard each Sunday morning at 8 on 98.3 WOW-FM here in Central Iowa. Not from here? No problem click this link and listen live! Today we're going to spend some time talking about FOOD. Not so much what is good for you but what people fear. It's true, nearly 1/2 of the population fears eating food will make them ill. We're not making this up. It's from an Associated Press / Ipsos Poll released last week. Bottom line: Folks are scared about buying food and just don't trust the food chain safety. And, can you blame them? Our answer was to start dealing directly with the growers. The number of farmers markets and small farms that sell directly to consumers has seen dramatic growth. It means more planning on your part but the reward is a piece of mind even the FDA can't seem to give you. In a related story we talked about organic foods and about the recent study that says organic food is not any more nutritional than non-organics. Here is the report. 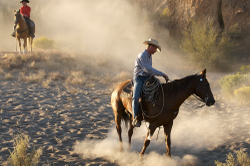 The American Cowboy is facing yet another challenge. Less work and higher fuel prices have made the trade less attractive. The number of working cowboys continues to dwindle...but this time it's not the railroads causing them to go find them "city jobs". Here is the whole story. Are we in for a late frost? Iowa State's Elwynn Taylor suggests we are...we'll tell you about it. We had a bit about an upcoming event, "Good Sport! Good Show! Weekend" at Living History Farms....a great place to take the family and lots of fun headed this way. Our Highway 6 - Tip of the Week was about cooling off your horse with more comfortable stalls, iced treats and proper planning. And, our guest this morning are Rod and Karen Haworth of The Grape Escape. A fun interview with folks who just had a bunch of people over to watch a movie and sip on some wine. We talked to them about lots of things from marketing to why in the heck they decided to do something like this. Oh...and of course...where did that great logo come from and why the motorcycle... Rod and Karen Haworth from The Grape Escape today on Highway 6 - Your Road to the Country. We've got a bunch on the show for Sunday hope you enjoyed what you heard!